The term diaphragma derives its origin from the Greek dia = “through, apart” + phragma = “a fence.” In medical parlance, it is used to describe a thin sheet of material forming a partition. In cameras or optical systems, a diaphragma is a device for varying the effective aperture of the lens. The diaphragma sellae is a barrier between the intracranial and extracranial compartments and it also has an opening in it. This orifice in the diaphragma sellae has caused abundant confusion and changes in surgical strategy for the management of pituitary tumors. The diaphragma sellae is a sheet of dura mater that forms the roof of the pituitary fossa. It is described as a two-layer sheet of dura mater that merges anteriorly with the dura covering the planum sphenoidale and the anterior cranial fossa and posteriorly with the dura covering the dorsum sellae and the clivus. The superficial layer continues laterally as the roof and the lateral wall of the cavernous sinus. The inner layer is said to continue laterally and to form the inner layer of the lateral wall of the cavernous sinus. The pituitary stalk courses through an opening or an aperture in the diaphragma sellae to reach the hypophysis. The size of this gap in the diaphragma sellae varies and some authors have classified this opening based on its dimensions. In a cadaveric study, Campero et al. studied the anatomy of the diaphragma sellae. They found that the opening in the diaphragma sellae for the passage of the infundibulum differed in individuals. They believed that this opening was responsible for directing the growth of pituitary tumors. Persons who had a deficient opening were more susceptible to suprasellar intracranial extension, and persons with a smaller gap would have a parasellar extension into the cavernous sinus. They also thought that the larger opening in the diaphragma sellae would be a deterrent to transsphenoidal excision of pituitary tumors. Surgical Implications – transphenoidal or Transcranial? The first surgery recorded for a pituitary tumor was performed by Sir Victor Horsley in 1889 by a transcranial approach. It was followed by in 1907 the transsphenoidal approach performed by Hermann Schoffler. Since these early attempts, the transsphenoidal approach has gone from being popular to being forgotten to being revived and accepted again. Although not discussed frequently, the anatomy of the diaphragma sellae and its relationship with growing pituitary tumor may have had a role in deciding the surgical approach for pituitary tumors. It had been believed that the suprasellar component of the pituitary tumor grew through the opening in the diaphragma sellae and extended intracranially. The constriction in the “figure of 8” appearance of the pituitary tumor was thought to be the edge of this gap in the dural membrane. This so-called intracranial extension formed the pivotal factor in dictating the approach to pituitary tumors. Tumors that did not have a suprasellar extension were approached transnasally and tumors with a suprasellar extension were operated transcranially. Essentially, between 1926 and 1927, it was the general practice to treat pituitary adenomas by the transsphenoidal approach unless a suprasellar extension or presence of another tumor was anticipated. Cushing started using the transfrontal route for pituitary tumors from 1929 to 1932. The exact reasons for this digression from transsphenoidal route were not very clear although some stated that he preferred this route due to better recovery in vision and lower recurrence rate. However, it appears that this preference to the transcranial approach may be due to the mixture of suprasellar pathologies that were operated by Cushing during the time period, which would have required the transfrontal approach. 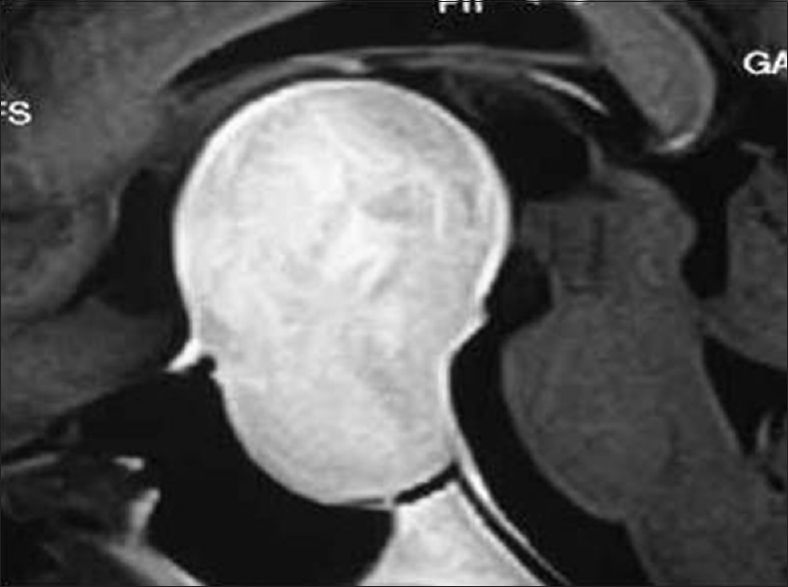 He stated, “In increasing numbers, both in children and adults, suprasellar tumors presenting with secondary hypophyseal symptoms are being recognized, and if the sella is not enlarged, an approach from above is necessitated.”, Many of the neurosurgeons of the time followed Cushing's example and started favoring the transcranial approach over the transsphenoidal approach. However, a handful of neurosurgeons especially in Europe continued to use and propagate the transsphenoidal approach. Dott and Bailey after working as assistants to Cushing from 1923 to 1924 formed their own conclusions which were similar to Cushing at that time: “It is essential to form an opinion as to whether the tumor is or is not an adenoma, since from a surgical standpoint the correct differentiation of the adenomata from the various parahypophysial lesions is of the first importance.”, Suprasellar tumors and likewise adenomata, which have invaded the cranial chamber, must be approached from above. Hence, essentially, it was believed that tumors confined to the sella and without a suprasellar extension were operated transsphenoidally and those with a large suprasellar extension were operated transcranially. Based on this presumption, Hardy proposed the following classification for pituitary tumors. Hardy classified pituitary tumors as infradiaphragmatic or supradiaphragmatic in their growth patterns. According to them, the natural growth of the infradiaphragmatic type of pituitary tumors made them an ideal indication of a transsphenoidal approach. Hardy classified pituitary tumors primarily into sellar and suprasellar tumors. The sellar tumors were further divided into noninvasive and invasive. Grade II – intact with enlarged fossa. Grade IV – diffuse destruction. The suprasellar tumors were divided into symmetrical and asymmetrical. Grade C – Whole anterior third ventricle. 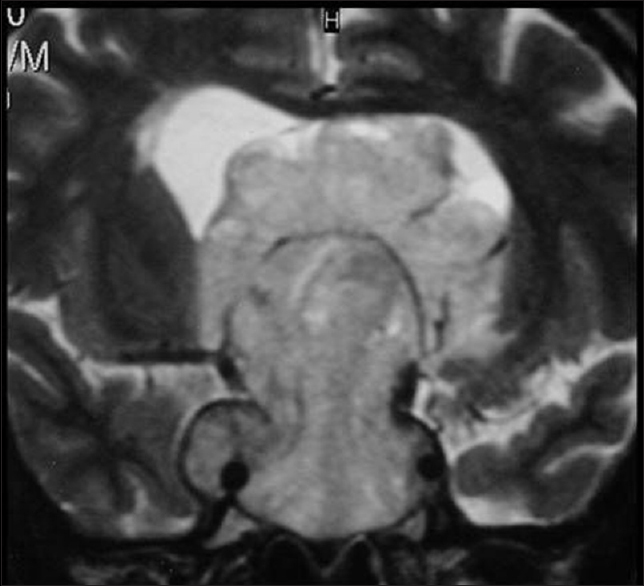 Grade E – extracranial extradural (cavernous sinus). This classification has been the workhorse for management of pituitary tumors. On the basis of this general understanding, the surgeons continued to prefer the transcranial approach for suprasellar extensions of pituitary tumors, as these tumors were generally considered to be in the intradural subarachnoid space. Some surgeons believed that the tumor capsule merged with the arachnoid layer making it a thick barrier surrounding the tumor. At the point, where the tumor maximally compresses the brain, there is an arachnoid membrane between the tumor and the brain, which facilitates separation of the two when approaching from the tumor side. Hashimoto et al. stated that on approaching pituitary tumor from the transcranial route, the tumor is on the opposite side of the arachnoid membrane. Over time, although the transsphenoidal approach was revived for pituitary tumors, it was by no means exclusive. The tumors that were believed to have an “intracranial extension” through the opening in the diaphragma were still treated by a transcranial route. In 2004, Goel et al. published their understanding of the growth of pituitary tumors based on the anatomy of the diaphragma sellae and the dural walls of the cavernous sinus. For the first time, they recognized that in majority of cases of large or giant pituitary tumors, the diaphragma sellae was elevated and stretched over the dome of the tumor and is not transgressed at the level of superior rim of bony sella as was generally understood earlier. The concept that the diaphragma sellae is elevated and not transgressed had significant implications in the progress of surgical conduct of these tumors. They also described that the transgression of the medial wall of the cavernous sinus is a frequent event, but transgression of the lateral wall and the roof of the cavernous sinus is “almost” never seen. They first described the elevation of the dural roof of the cavernous sinus by the pituitary tumors. It appears that these descriptions helped in the growth of surgery of pituitary tumors and enhanced the scope of surgery from the nasal route. The concepts of anatomy revolutionized surgical approaches to large and giant pituitary tumors in general and particularly for tumors that invaded into the cavernous sinus., Introduction of endoscope-based surgery assisted in developing this concept further. Goel et al. discussed a classification for giant pituitary tumors on the basis of the dural relationships of the diaphragma sellae. The classification helped in characterizing these tumors, assisted in developing a surgical plan, and predicted the surgical and long-term outcome. They were where the Grade I tumors invaded the confines of the cavernous sinus [Figure 2]. Cavernous sinus invasion could be confirmed on MR imaging if the tumor extended on both sides of the carotid artery. Although bulged out laterally, transgression of the lateral dural wall of the cavernous sinus was not observed, suggesting the relative firmness and the resistance offered by the lateral dural wall of the cavernous sinus., In cavernous sinus, the tumor encased the internal carotid artery, but the diameter of the artery was seldom compromised. Cavernous sinus invasion was observed even in some small or moderately large pituitary tumors. The ease of invasion of the pituitary tumor into the cavernous sinus and transgression of its medial dural wall suggests that this wall of the cavernous sinus may not actually be dural in nature. Various authors have considered cavernous sinus as an extradural structure and this observation could lend support to this concept. However, it was observed that the tumor never actually elevated the entire cavernous sinus or elevated the middle fossa or temporal dural layer superiorly or extended into the extradural compartment. This suggests that the medial wall of cavernous sinus actually allows the tumor to enter into the ”compartment” of cavernous sinus and not in the “extradural” space. “Weakness” of the superior wall of the cavernous sinus and its elevation as a result of the presence of an intracavernous sinus meningioma has been described earlier. Grade II tumors that selectively elevated the roof of the cavernous sinus were labeled as Grade III pituitary tumors [Figure 3]. It was observed that majority of cases where the superior wall of the cavernous sinus was bloated up, the area of the superior wall involved was relatively small, and it gave an appearance of a balloon with the base toward the roof of the cavernous sinus. This suggested that a part of the superior wall of the cavernous sinus was thinner than the rest of the wall and could not resist the pressure. The superior wall of the cavernous sinus matched in the elasticity but was significantly thinner than the diaphragma sellae. The giant pituitary tumors, which transgressed the diaphragma sellae boundary and encased the arteries of the circle of Willis, were included in Grade IV [Figure 4]. In these cases, it appeared that the tumor extended into the subarachnoid space of the brain and encased arteries and perforators. The exact site of dural dehiscence could not be confirmed. Based on these observations, Goel et al. advocated the transsphenoidal approach as the primary approach to all pituitary tumors.,,, This is probably the first instance where the transsphenoidal approach was conclusively advocated for surgery of pituitary tumors. The concept that the diaphragma is intact on the dome of the pituitary tumors has revolutionized and restored transsphenoidal surgery for these tumors. It has also made endoscopic approaches for the excision of these tumors feasible. Thus, the transsphenoidal approach to pituitary tumors has become the standard of care. However, in its evolution, we have not given due importance to the contributions of the anatomy of the diaphragma sellae as proposed by Goel et al. to the establishment of transsphenoidal surgery. Campero A, Martins C, Yasuda A, Rhoton AL Jr. Microsurgical anatomy of the diaphragma sellae and its role in directing the pattern of growth of pituitary adenomas. Neurosurgery 2008;62:717-23. Youssef AS, Agazzi S, van Loveren HR. Transcranial surgery for pituitary adenomas. Neurosurgery 2005;57:168-75. Cushing H. Acromegaly from a surgical standpoint. Br Med J 1927;2:1-9, 48-55. Cushing H. Disorders of the pituitary gland. Retrospective and prophetic. JAMA 1921;76:1721-6. Rosegay H. Cushing's legacy to transsphenoidal surgery. J Neurosurg 1981;54:448-54. Dott NM, Bailey P. A consideration of the hypophysial adenomata. Br J Surg 1925;13:314-66. 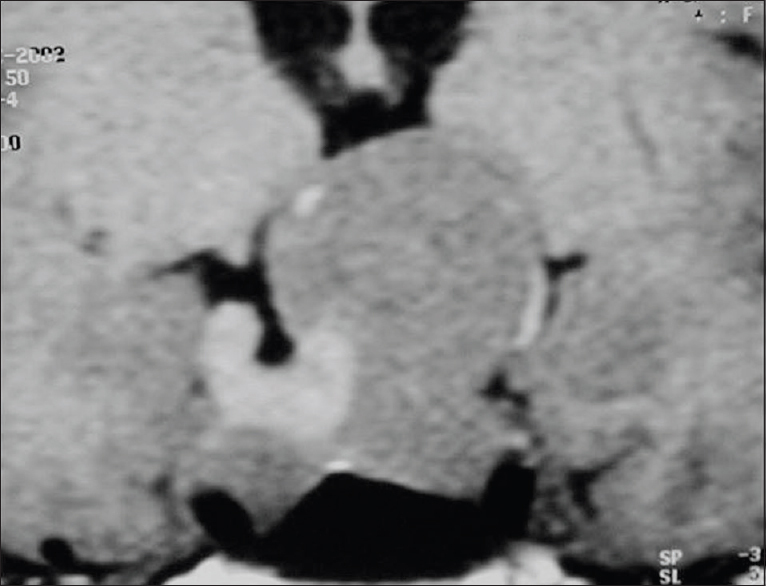 Mohr G, Hardy J, Comtois R, Beauregard H. Surgical management of giant pituitary adenomas. Can J Neurol Sci 1990;17:62-6. Hashimoto N, Handa H, Yamagami T. Transsphenoidal extracapsular approach to pituitary tumors. J Neurosurg 1986;64:16-20. Goel A, Nadkarni T, Muzumdar D, Desai K, Phalke U, Sharma P, et al. Giant pituitary tumors: A study based on surgical treatment of 118 cases. Surg Neurol 2004;61:436-45. Goel A, Nadkarni T. Medial compartment of the cavernous sinus. J Neurosurg 1995;83:763-4. Agrawal A, Cincu R, Goel A. Current concepts and controversies in the management of non-functioning giant pituitary macroadenomas. Clin Neurol Neurosurg 2007;109:645-50. Goel A. Letter to the editor: Pituitary tumors and cavernous sinus extension. J Neurosurg 2016;124:1129-30. Kawase T, van Loveren H, Keller JT, Tew JM. Meningeal architecture of the cavernous sinus: Clinical and surgical implications. Neurosurgery 1996;39:527-34. Goel A. Challenge of giant pituitary tumors. World Neurosurg 2014;82:e121-4. Goel A. Letter to the editor: Surgical management of pituitary macroadenomas. J Neurosurg 2016;125:516-8.